Wouldn't it be wonderful to have your message sent out constantly for over a FULL YEAR at one low price!? Check it out! Our publications can't be beat for value and cost! We'll Make Sure You're There!!! As of January, 2006, all Handbooks and Pet-Friendly Maps & Resource Almanacs are printed in full color! Also, please note that the CA/AZ/NV RV Campground Maps have been resized to better fit display cases and glove compartments. • Additional Lines are $48.00 each. FREE LISTING with all display ads! Add 20% for positions in premium locations. Additional listings with displays are half price per listing. Color proofs will be provided for layout purposes & estimated color values only. Actual colors may vary due to differences in types and brands of printers used. See Terms and Restrictions for other applicable requirements. The Ulitimate in Doggie Day Care! Once Pre-Screened, arrive in the "Doggie Limo" and Romp all day Outdoors on 5500 sq. feet of artificial grass. Ultimately, a Tired Dog is a Happy Dog. 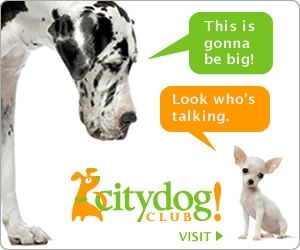 Start your own successful and legal pet sitting business. New Online Courses in the comfort of your home or Two-day Seminar with instructions through lectures, videos and student participation. Seminar includes: Instruction, 100-page study guide, your OWN web site and 15 customizable business forms and two books on the pet sitting industry. Become a Professional Pet Sitting business owner. Art must be submitted in 72 dpi. Acceptable file formats are: ai, jpg, psd, eps, pdf, and tif. If digital art is not available, we can scan from high-quality photos. If needed, we can design your online ad at an additional fee. Any changes requested after the initial proof has been corrected and not due to our error are subject to an additional charge of $10.00 per change. "Your PetLovers Maps are one of the most popular information sources at our Chamber and Visitors Bureau. We can hardly keep them in stock." Sheila McDonnell, President, Del Mar Chamber of Commerce. "Out of my 8 hour work day, 6 of it is usually spent with PetLovers Handbooks and Maps in my hand giving referrals." "I've seen a lot of animal publications. These are the most comprehensive and useful to date. Please send me all the copies you can spare for distribution in our mobile units." Shawn Jefferson, Mobile Administrator for L.A. County Animal Services. "The PetLovers Handbooks and Maps are one of the hottest commodities we distribute at this center. We have a lot of newcomer and visiting petowners seeking this information. Keep them coming!" "I think I just asked you for more handbooks recently, but it appears that your guides are so popular that we are always out. Do you have some more inventory that you would not mind sending my way?" "Just wanted you to know that your Pet Lovers booklet is bringing in inquiries for Good Dog University. Great work!" "I've already received 3 new cases that were referrals from your publication." "Last weekend was the Reliant Series of Dog Shows - the big four day dog show in Houston. We had your maps at our booth and asked for a dollar donation, and people LOVED them! We sold a few t-shirts and a few caps, but the bulk of the $550 we raised was from donations for your maps. Thank you so much for all the work you did putting these together for Houston dog lovers!" "I have a copy of your wonderful PetLovers Guide to Dog Walks and Dog Beaches. Can I order more copies? I can't wait to share them with my dog owners group!" "Please send us more maps and handbooks….all areas. I'm amazed at the response we're getting to these." "Your PetLovers Maps and Handbooks just seem to walk out the door. Send us a lot more copies." "I would be remiss if I didn't mention how valuable your brochure on Dog Walks & Beaches plus Pet-Friendly Hotels & Restaurants has been!! 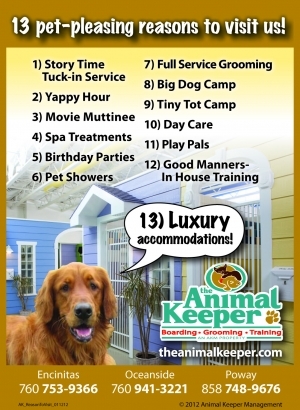 Businesses that cater to pet owners need to be in your publications. I've found that pet owners like to support pet-friendly companies whenever there is a choice." "We check on where our regular and web referrals come from and are very pleased with the continuing response we get from advertising with these publications." Wait a few seconds for each movie to load, hold down the mouse button on the photo and drag up, down or sideways for a panoramic tour. If black-and-white frames come into view, QuickTime is still loading that portion of the file. After a few seconds, the frames will disappear. There is a wealth of information for all pet lovers in every one of these publications. Each pet-friendly map or handbook is specifically tailored to that geographical area. Find everything you need for you and your pet in any one of these exclusive editions! Click Here to fill out an order form and submit payment. All handbooks and maps are $3.50, and RV Campers Guide for CA/NV/AZ are $4.50. Now Available in Downloadable PDF Files! If download does not start immediately, right-click (mac users: option click) the link and choose "save target as." Pet boarding, including a newly designed cat boarding facility, dog obedience training, grooming, pet pampering and daycare. Family owned and operated on six beautiful acres, Canine Hilton is accredited by the Pet Care Services Association, one of only seven kennels in Texas to receive this accreditation. We are also long time members of the Better Business Bureau. These stores feature supplies, pet food and gift items in a unique setting. Proceeds from Pet Parade & Retails directly benefit the animals at the Houston SPCA. 900 Portway Drive and Galleria III, Level II. Adopt a Shelter Pet & Save a Life! Our Ontario Hospital is a 24-hour specialty and emergency facility committed to excellence in internal medicine, surgery and critical patient care. Our family of specialists, dedicated emergency clinicians, and experienced staff, provide a unique team approach to referral medicine. We work closely with your primary care doctor to provide the very best in continued care of your pet. At Otay vet we take the necessary time to orient out clients and to recommend the best veterinary medicine to get an accurate diagnosis and an effective treatment. ENTERTAIN YOUR VERY BEST FRIEND!